Singapore Telecommunications Limited provides integrated infocomm technology solutions to enterprise customers primarily in Singapore, Australia, the United States of America, and Europe. The company operates through Group Consumer, Group Enterprise, and Group Digital Life segments. The Group Consumer segment is involved in carriage business, including mobile, pay TV, fixed broadband, and voice, as well as equipment sales. The Group Enterprise segment offers mobile, equipment sales, fixed voice and data, managed services, cloud computing, cyber security, and IT and professional consulting services. The Group Digital Life segment engages in digital marketing, regional video, and advanced analytics and intelligence businesses. The company also operates a venture capital fund that focuses its investments on technologies and solutions. Singapore Telecommunications Limited is headquartered in Singapore. superman11 Why sgx in i3investor doesnt have financial technical analysis like klse?? NotAbel Tan will the fourth Telco... impart further the share prices of Singtel? superman11 why singtel keep dropping? pickey Ya, any bad news? 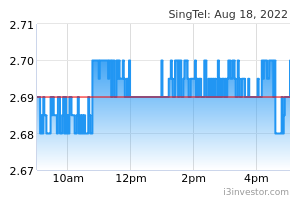 SingTel is another good stock to trade these days. It may have good up movement in the end of year. Feel free to ask your queries. bluelight Time to accumulate more to collect dividend? qps999 not much..but save my money with the help of Money life research sggested tgt..hit it..@lim..come with me.